A new Transparency Market Research report on the global coal fired generation market provides comprehensive statistic pertaining to the growth, size, and future forecasts for the market. The report is titled “Coal Fired Power Generation Market - Global Industry Analysis, Size, Share, Growth, Trends and Forecast, 2013 - 2019” and is available on the company’s website for sale. The findings of this report project growth for the market at a positive 3.1% CAGR between 2013 and 2019. The global coal fired power generation market exhibited an installed capacity of 1,673.1 GW in 2012. The demand for coal fired power generation is mainly driven by high demand for electricity for an array of industrial, commercial, and residential applications. Such factors are likely to boost the overall capacity of coal fired power generation to 2,057.6 GW by the end of 2019. The global power generation market is segmented in terms of technology, application, and geography, so as to present a critical analysis of how the various categories contribute to the overall growth of the market. In terms of technology, the global market for coal fired power generation is categorized into pulverized coal systems, cyclone furnaces, and others (fluidized bed combustion and coal gasification). Coal fired power generation finds key application in residential and commercial sectors. Geographically, the market can be segmented into North America, Europe, Asia Pacific, and Rest of the World.Of the key geographic segments, Asia Pacific dominated the market for coal fired power generation in 2012, accounting for a significant 56% share of the overall installed capacity registered by the market. According to the report, the market for coal fired power generation in Asia Pacific is expected to grow exponentially during the forecast period. The construction of new plants for coal fired power generation across the region will pave the way for further expansion of the market. North America dominated the global coal fired power market in 2012 on the basis of revenue, accounting for 21% of the total market. On the basis of application, the commercial sector dominated the market with a 56% share of the global industry. The residential sector will register tremendous growth in the demand for solar and hydro power, thereby adversely affecting the demand for power generated from coal from the sector. 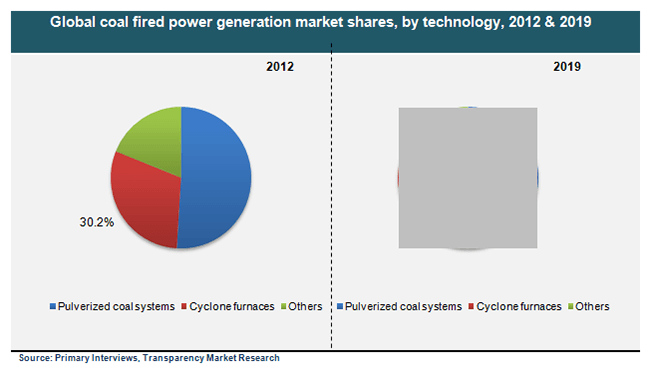 Pulverized coal systems led the market in 2012, accounting for more than half of the total market. High availability of raw materials together with increasing demand for power drove the demand for pulverized coal systems in coal fired power generation market. To present a detailed competitive analysis, the report includes an exhaustive section dedicated to key market players. Among the leading players of the market, China Huaneng Group, China Datang Corporation, Shenhua Group Corporation Limited, and KEPCO collectively held 22% of the global coal fired power generation market.